This article provides descriptions and instructions for Cloud App Security activity filters and queries. Below is a list of the activity filters that can be applied. Most filters support multiple values as well as NOT to provide you with a powerful tool for policy creation. 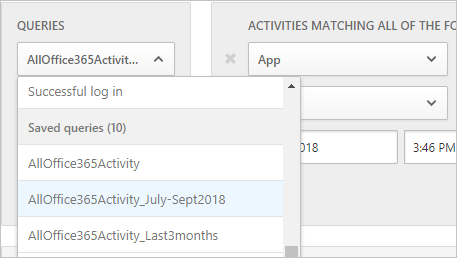 Activity ID - Search only for specific activities by their ID. This filter is useful when you connect Microsoft Cloud App Security to your SIEM (using the SIEM agent), and you want to further investigate alerts within the Cloud App Security portal. Activity objects – Search for the objects the activity was done on. This filter applies to file, folder, user, or app objects. Activity object ID - the ID of the object (file, folder, user, or app ID). Item - Enables you to search by the name or ID of any activity object (for example: user names, files, parameters, sites). For the Activity object Item filter, you can select whether you want to filter for items that Contain, Equal, or Starts with the specific item. Activity type - Search for the app activity. Administrative activity – Search only for administrative activities. Alert ID - Search by alert ID. App – Search only for activities within specific apps. Applied action - Search by governance action applied: Blocked, Bypass proxy, Decrypted, Encrypted, Encryption failed, No action. Date – The date when the activity occurred. Filter supports before/after dates and a date range. Device tag - Search by compliant, managed or verified device. Device type - Search only for activities that were done using a specific device type. For example, search all activities from mobile devices, PCs, or Tablets. Files and folders - Search for files and folders the activity was performed on. File ID - Enables you to search by the File ID the activity was performed on. Name - Filters on the name of files or folders. You can select if the name ends with, equals, or starts with your search value. Specific files or folders - Allows you to include or exclude specific files or folders. When selecting files or folders, you can filter the list by App, Owner, or partial File Name. IP address – The raw IP address, category, or tag from which the activity was performed. Raw IP address - Enables you to search for activities that were performed on or by raw IP addresses. The raw IPs can equal, don't equal, start with, or don't start with a particular sequence. IP category - The category of the IP address from which the activity was performed, for example, all activities from administrative IP address range. The categories need to be configured to include the relevant IP addresses, except for the "Risky" category, which is pre-configured and includes two IP tags - Anonymous proxy and Tor. To learn how to configure the IP categories, see Organize the data according to your needs. Impersonated activity – Search only for activities that were performed in the name of another user. Instance - The app instance where the activity was or wasn't performed. Location – The country from which the activity was performed. Matched policy – Search for activities that matched on a specific policy that was set in the portal. Registered ISP – The ISP from which the activity was performed. App connector - logs coming directly from the app’s API connector. App connector analysis - Cloud App Security enrichments based on information scan by the API connector. User – The user who performed the activity, which can be filtered into domain, group, name, or organization. In order to filter activities with no specific user, you can use the ‘is not set’ operator. User domain - Search for a specific user domain. User organization – The organizational unit of the user who performed the activity, for example, all activities performed by EMEA_marketing users. User group – Specific user groups that you can import from connected apps, for example, Office 365 administrators. User name - Search for a specific username. To see a list of users in a specific user group, in the Activity drawer, click on the name of the user group. Clicking will take you to the Accounts page that lists all the users in the group. From there, you can drill down into the details of the accounts of specific users in the group. Activity object only - meaning that the user or user group selected didn't perform the activity in question, they were the object of the activity. Actor only - meaning that the user or user group performed the activity. Any role - Meaning that the user or user group were involved in the activity, either as the person who performed the activity or as the object of the activity. User agent – The user agent of from with the activity was performed. User agent tag – Built-in user agent tag, for example, all activities from an outdated browser or outdated operating systems. To make investigation even simpler, you can now create custom queries and save them for later use. In the Activity log page, use the filters as described above to drill down into your apps as necessary. After you've finished building your query, click the Save as button in the top right corner of the filters. In the Save query popup, name your query. To use this query again in the future, under Queries, scroll down to Saved queries and select your query. Admin activities - filters all your activities to display only those activities that involved admins. Download activities - filters all your activities to display only those activities that were download activities, including download user list as a .csv vile, downloading of shared content and downloading a folder. File and folder activities - filters all your activities to display only those activities that involved files and folders. The filter includes upload, download, and accessing folders, along with creating, deleting, uploading, downloading, quarantining, and accessing files, and transferring content. Impersonation activities - filters all your activities to display only impersonation activities. Mailbox activities - filters all your activities to display only Microsoft Exchange Online activities such as create item, purge messages from mailbox, update message and send message using Send As permissions (impersonation). Password changes and reset requests - filters all your activities to display only those activities that involving password reset, change password, and force user to change password on next sign-in. Security risks - filters all your activities to display only those activities that match DLP policies. Sharing activities - filters all your activities to display only those activities that involve sharing folders and files, including creating a company link, creating an anonymous link and granting read/write permissions. Successful log in - filters all your activities to display only those activities that involve successful log ins, including impersonate action, impersonate log on, single sign-on log-on, and log on from new device. Additionally, you can use the suggested queries as a starting point for a new query. First, select one of the suggested queries. Then, make changes as needed and finally click Save as to create a new Saved query.